I reveived an error while trying to remove a host from a cluster. 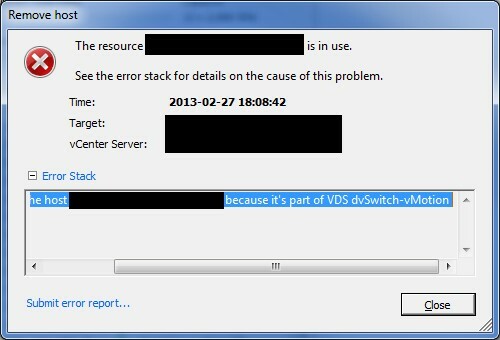 This error is correct 🙂 As you can probably see by it’s name, this host is connected to a dvSwitch called dvSwitch-vMotion. Obviously it’s used for vMotion. To be able to remove the host from the cluster I had to disconnect it from the dvSwitch. 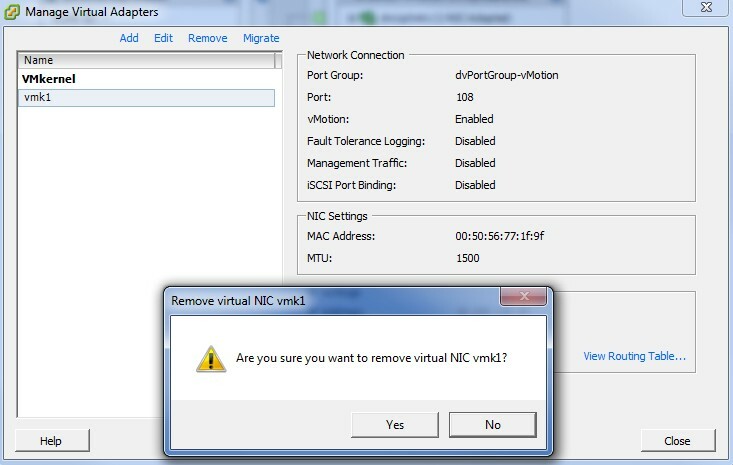 This error is also correct 😉 You have not disconnected the virtual adapter from the portgroup! Go back to your host. Select the Configuration tab and go to the Networking config. 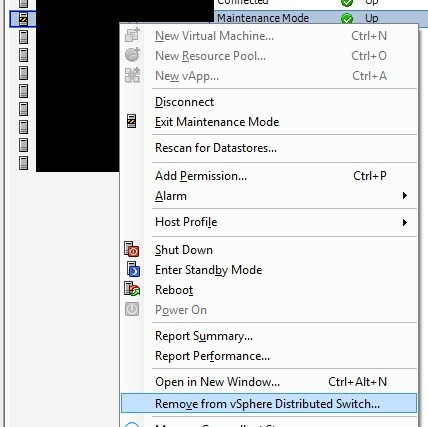 Select vSphere Distributed Switch. Here you can see the virtual adapter that’s still connected to the portgroup. Select Manage Virtual Adapters. You’ll see a list of the connected adapters. I’m my case it’s only 1. Select the adapter you want to remove and click Remove. Again, think a second about the warning. Now you’re able to disconnect the server from the dvSwitch. Press Ctrl-Shift+N again and remove the host from the vSphere Distributed Switch. The remove process will disconnect your dvUplinks for you and your physical adapters will be free for other use. And now you’re able to remove your host from the cluster. Congrats, you did it! Have a good one. I created a new cluster with 4 hosts and forgot to set the default Path Selection Policy (PSP). To fix this I’ll use PowerCLI. In my case I want to use the PSP RoundRobin for all my device paths to disks. Change the PSP according to your preferrence. VMW_SATP_DEFAULT_AA is what SATP is in use. I’ll use that one to set the default PSP on.